It's been a long, cold winter. But finally, baseball. The season is upon us, with all the glory, tradition and tobacco that comes with it. And if you plan on going to a few games this summer, it's not a bad idea to have a friend who's sat in your seat, and seen what you'll see. Welcome to Seats3D, a new site that gives you a three-dimensional peek at seats inside many of the country's finest stadiums, concert halls and arenas. 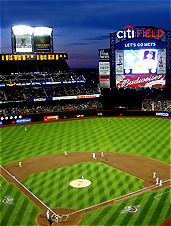 Right now, the site includes stadiums for all the major team sports, as well as some not-so-major ones. (Let's just say you can get very good seats for the Colorado Mammoth. They play lacrosse.) The site even includes some international venues, so you'll be able to scope out, say, the best seats in the Tokyo theater district.